Literally either side that is, not metaphorically, or almost either side, or either side in the exaggerated sense an angler might say his catch was as large as a whale. I was within the goring arc of those horns, mounted with adamantine surety in their bone bracket on that dense bovine skull, the great extendable neck behind them, the vast goring muscles of the shoulders behind that – the morillo, the defining feature of the breed. My back was fixed and framed by that steel fence, held in place for the horns to go in either side in the classic double punch of the toro bravo, and the hospital was an inevitably fatal 45 minutes away in Valladolid. There was no ‘move’ I could make: no tricks or quips in my taurine armoury to fall back on. Quite the reverse in fact, any movement would have invoked that death-strike: to even attempt to reach up and grab the horns for safety would have the end. I looked into his black eyes and he, unseeing, looked out from behind them. Then he moved, and I moved, and he tried to catch me, but it was too late, Thank God. I would say that the experience changed me, but nothing really does that. 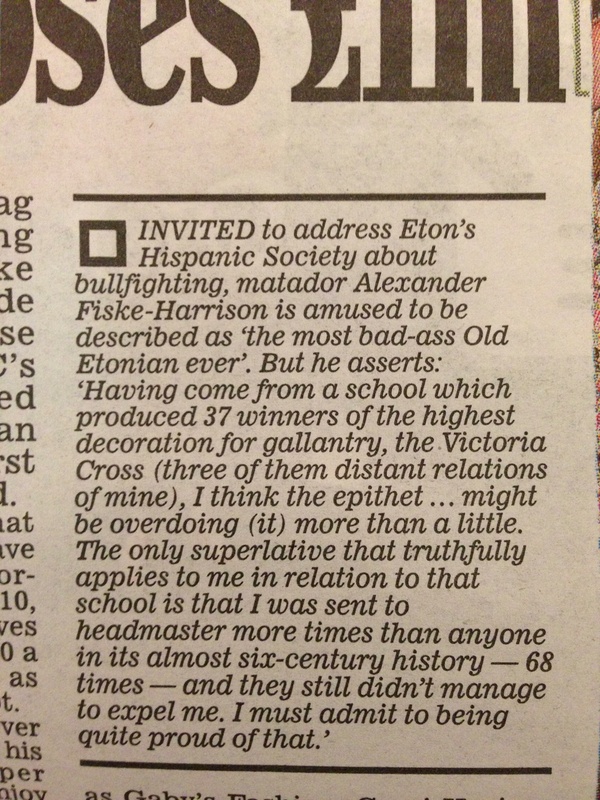 So, my frivolity has returned and I can smile to find myself invited back my old school, Eton College in Berkshire, to talk the Hispanic Society about “The World Of The Spanish Bullfight (the subtitle of my William Hill Sports Book of the Year 2011 shortlisted Into The Arena, most recently described by my former ‘bullfighting pupil’, Evgeny Lebedev in his newspaper The Independent as “the definitive guide on the state of modern-day bullfighting.”) The poster advertising my talk around the school is simply hilarious. Having come from a school which produced 37 winners of the highest decoration for gallantry, the Victoria Cross (three of them distant relations of mine), I think the epithet “most badass OE ever” might be overdoing more than a little. Indeed, having just been filming interviews and narration segments for ‘Ultimate Survivors’ which will be aired next year on the Discovery Channel and hosted by another ex-army OE, Bear Grylls, I can think of plenty of other candidates. The only superlative that truthfully applies to me in relation to that school is that I was sent to headmaster more times than anyone in its almost six century history – 68 times – and they still didn’t manage to expel me. I must admit to being quite proud of that. As I sit down to write my speech I’ll leave you with English version of my thank you letter to Cuéllar, published last week in the regional newspaper, El Norte de Castilla. (The original Spanish is here.) 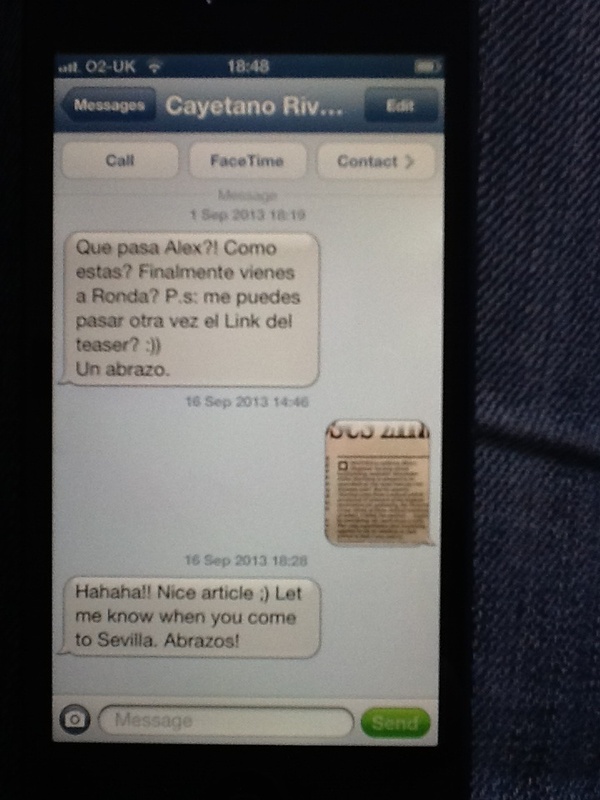 This is the second time I’ve thanked that town in their press – the first time is in Spanish here. I should also add that, having missed the Feria Goyesca de Pedro Romero de Ronda this year, I’ve decided to head with family and friends to Seville for the Feria de San Miguel once again this year. 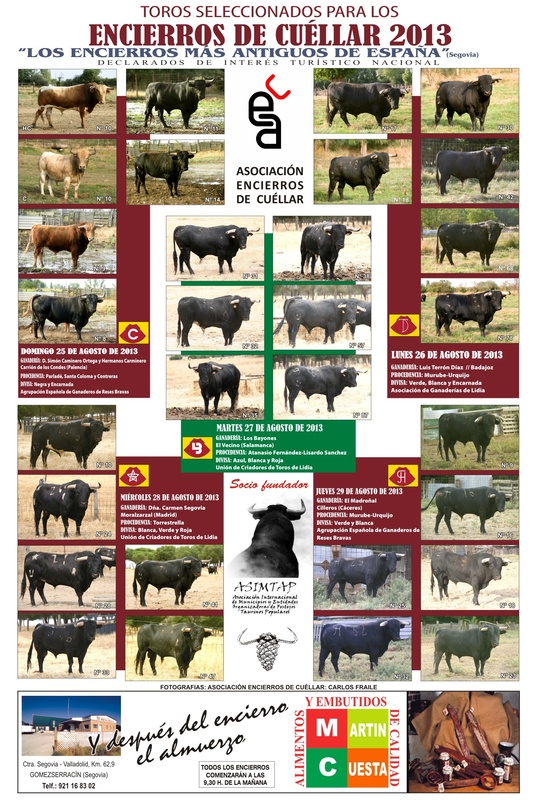 It is the final weekend in September, and the bullfighting cartels are excellent, particularly with El Juli and Morante de la Puebla both performing on the Sunday with the bulls of Juan Pedro Domecq. “If this could have been enough of a book it would have had everything in it.” This is how Ernest Hemingway, my maestro and mentor influence in the mundo taurino – ‘taurine world’ – began his final chapter in his often masterful introduction to los toros, Death In The Afternoon. In it, he goes onto to describe – in phrases as short in temporal duration but long in emotional after-effect as a trincherazo of Morante – the things he had seen in Spain during the 1920s. It was the things which I saw in Cuéllar that made me write a ‘thank-you letter’ to the town from London last year, which was printed in this newspaper (‘Gracias, Cuéllar, desde Londres‘) It was written as though from a guest to a house to which he had been invited, which is what it felt like, even though I had been sent there by the Financial Times (‘The real, old stuff‘). This year, writing again, I only wish this could be enough of a letter. But I know it will not. Last year I arrived in Cuéllar and met Dyango Velasco, proud citizen and great sculptor of that town, who literally gave us the keys to the city. This year I came back with a dozen friends and every door was opened to us again – this time even wider. The staff at the hotel we stayed at, once again, but this time filled to overflowing. We jostled for space with toreros and forcadores at Ruben Salamanca’s Mesón San Francisco, and it still serves the best suckling lamb in town. It was our refuge, and the tree-shaded pale stone benches of its gardens were our haven. And once again old Luis Quevedo and his beautiful wife Soco and their son Alberto looked after us with solomillo and toro bravo, while the local wine, Ribera del Duero, flowed a rich chill into us as we stood in the cool stone rooms of La Carchena where we ended every day and talked late into the night in Cuéllar’s medieval Castilian heart. And once again José María Yuste and his wife Aurora and their charming friends gave us lunch in their house where the famous exiled poet José de Espronceda lived and wrote. 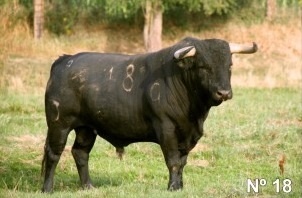 And once again my taurine Godfather in Cuéllar, Dr Larry Belcher, the only man who ever moved from riding the rodeo bulls in Texas to being a professor at a university in Spain – your neighbour Valladolid – brought wisdom to the streets as did his lovely wife Dr Ana Cerón from the hospital of that city also. However, this is not just a letter of repeat. I must thank the Godfather of all us foreign runners, Joe Distler, who watched over us from the comfort of the back row of the andanada sol in Almería, where only a toro as wise as he would know there is a querencia – a lair – of both shade and cool breezes, a wisdom born of almost half a century running every single encierro of San Fermín. Also we had Anthony Fane, Earl of Westmorland, who as a young man was chauffeur for the great Ordóñez who christened him Antonio II, and whose profound love of bulls, horses and the wild places of the world were combined into a fierce joy at seeing the hundreds of horsemen who draw into their command the bulls when they explode from the corrals in the woods in a moment of dust, madness and glory which defines your encierro. No longer on his horse, we had the light-footed jockey, Richard Dunwoody, champion of all of the most important horse races my country has, even the legendary Grand National so often competed in by your own former Duke of Alberquerque, with the difference that Richard won. Twice. In your race he ran with neither fear nor dishonour and ended smiling. And I must not forget ‘The Scottish Rocket’ Angus Ritchie in his yellow ‘Partick Thistle’ football shirt. 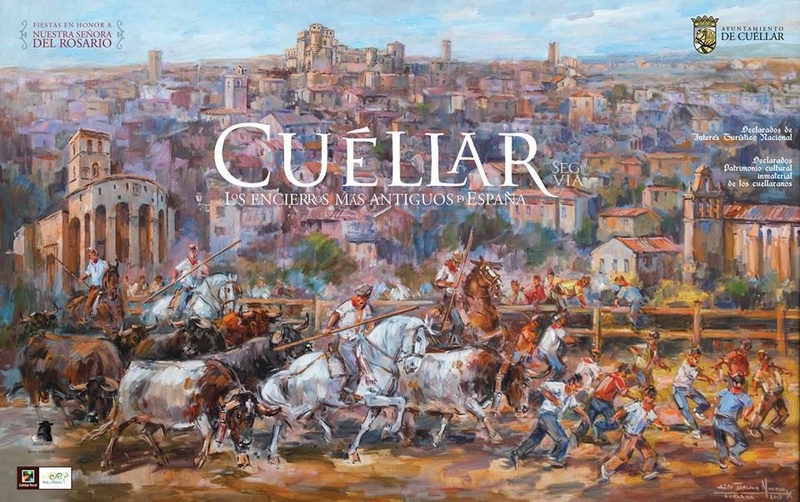 More important than the host of foreigners are the people of Cuellár, from your pastores, like Enrique Tantano whose sideburns remind me of my old friend Juan José Padilla, and who rules the sueltos with a deft hand, to those maestros of running with bulls, like the local Josechu Lopéz, or those from further away like Jokin Zuasti. 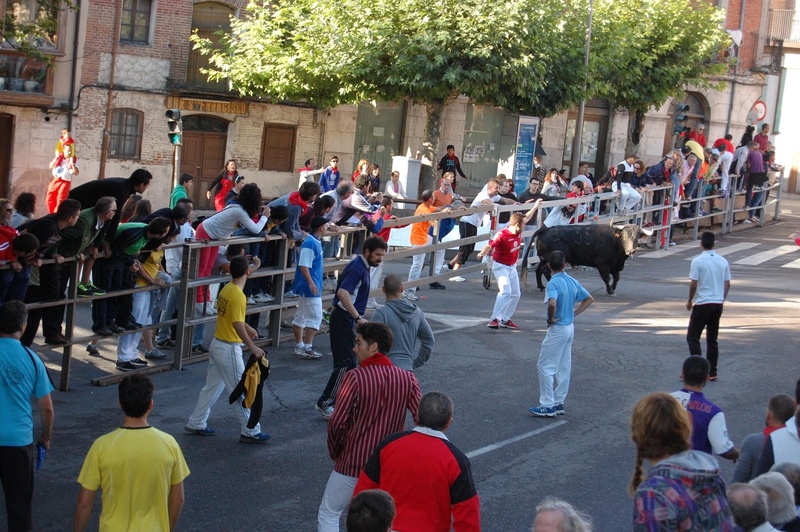 Running with the bulls, especially in Cuéllar, is not just about personal glory when “on the horns”, but also about brotherhood and sacrifice, respect and risking your life for others when it is required. I must also thank your mayor for his generosity and helpfulness, Jesús García Pastor – a good surname for such a man – and the finally the actual masters of the Fiesta, who give it bravura, the matadors. The austere and elegant El Cid whose awe-inspiring templar cut two ears from an impossible encaste Núñez. He began my aficion in Seville in 2007 and not for nothing did he start his career with those Victorinos before moving to smoother taurine canvases on which he could paint with more art. 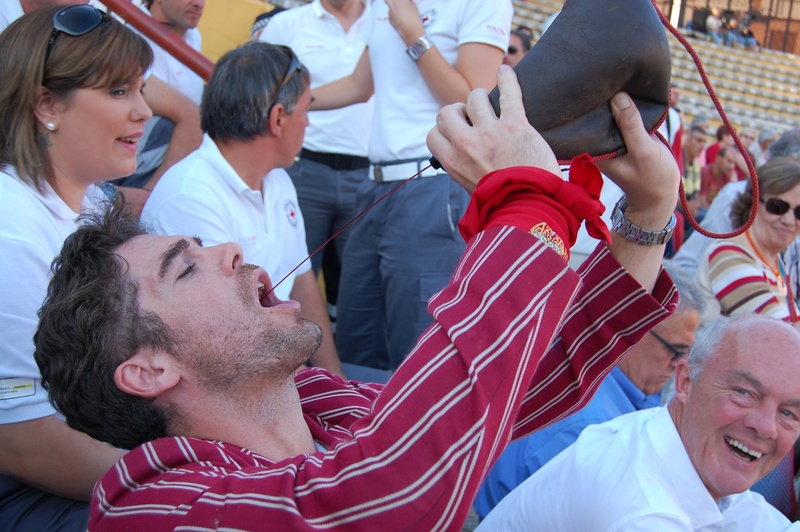 Meanwhile Javier Herrero displayed the courage and honour and generosity of the town with three ears and a Puerta Grande in the place of his birth. In the end, though, it is the intangible things that move you most in memory, a mood, a colour of light in the morning as the sweat cools after the run and the heart slows among dear friends joking with a shaking hand gripping a cool beer, while passers by shout out “chaqueta” at my blazer. Or the sight of the young novilleros unable to answer ‘suerte’ with ‘gracias’, their mouths are so dry as you share the lift down to the lobby, something I remember from my time dancing with and then dealing death to a three year old Saltillo. Or the little dog with his own pañuelo, and all the peñas with theirs handed to us along with drinks. 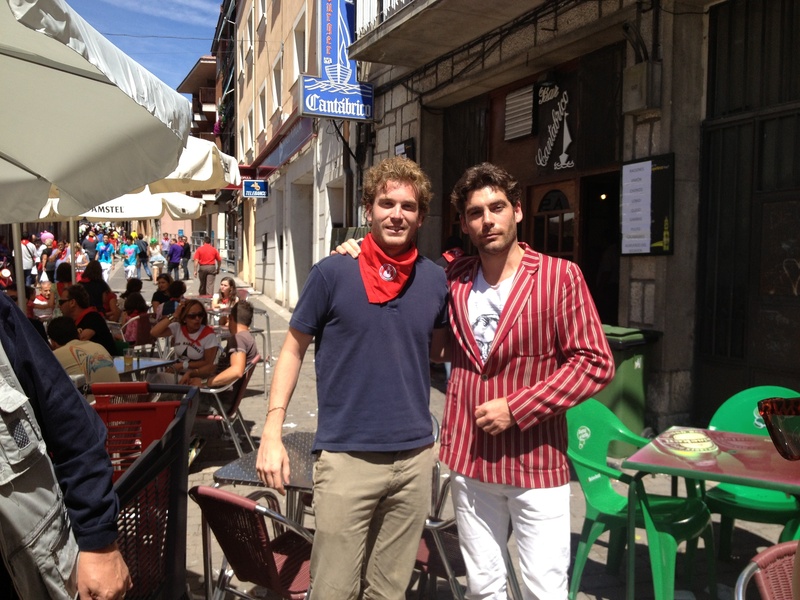 This is what will bring people to Cuéllar, will change them, and bring them back with more. Hemingway, with whom I began my aficion as I did this article, brought too many people to Pamplona, and many are the wrong ones. So it is ironic that I was pulled by his grandson John from a small pile-up of them in calle Estafeta on July 10th this year. I can only hope that we will bring to Cuéllar the right ones. And even if we don’t, we tried. 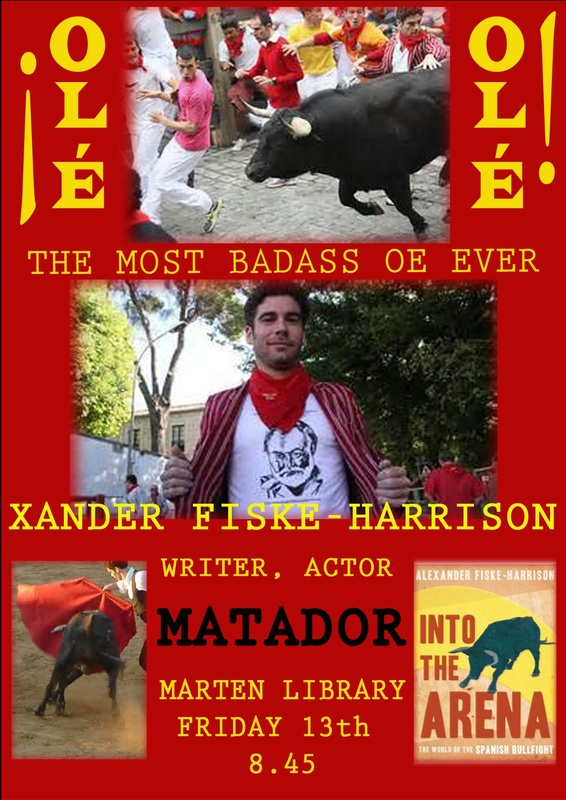 This entry was posted in Books, Bullfighting, Journalism, Talks and tagged Alexander, Alexander Fiske-Harrison, arena, british, bull, bullfight, bullfighter, bullfighting, bulls, class, corrida, english, eton, eton college, etonian, Fiske-Harrison, into the arena, lecture, matador, OE, old etonian, plaza de toros, Spain, Spanish, speech, talk, tauromachy, tauromaquia, toreador, toreo, torero, toro bravo, Toro de Lidia, toros, toros bravos, world of the spanish bullfight, xander, xander fiske-harrison by fiskeharrison. Bookmark the permalink.